I’m not a big history buff, but I watched The Tudors series on Netflix several years ago and was hooked. Given, it was highly dramatized, but you can’t tell me there weren’t clandestine meetings, backstabbings, political maneuverings, and power plays during that time. And then, of course, there was Henry and his wives. When I saw this book, I was instantly curious about a modern day retelling – in high school, no less. The author is very clever in how she created her characters based on the historical figures, bringing the queens, Henry, and some of their acquaintances into modern day. Cleves, based on Anne of Cleves, who was queen for a few short months, is Henry’s best friend. Like Henry VIII, this Henry has a wandering eye and a long string of girlfriends. Loosely paralleling their historical relationship, Cleves and Henry date for an awkward couple of weeks, but decide they’re better as friends. Cleves is blindly loyal, awkward, and her snark had me chuckling several times. Make no mistake – this high school is just as socially treacherous as Henry the VIII’s court, with suspicious deaths and characters falling out of favor. Scheming, plotting, and gossip abound, making up a large portion of the book, but occasionally don’t do much to advance the story. All the back and forth is difficult to follow at times, but once the book hits the 75% mark, things move along quickly. I didn’t enjoy this read as much as I’d hoped, but that’s more me than the book. 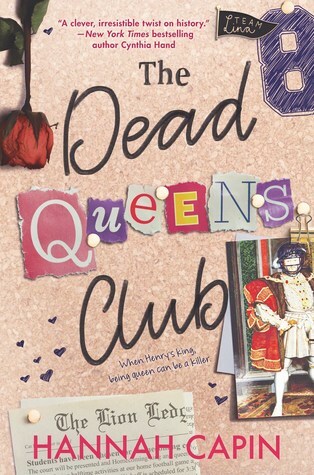 I’m not a big fan of Mean Girls and erratic high school drama, but judging by other reviews, many readers thought The Dead Queens Club was fabulous. This book is scheduled for publication January 29th, 2019. It’s too bad you didn’t enjoy the book as much as you hoped because the premise sounds so clever! It really is a clever premise, Priscilla, and I enjoyed seeing familiar names among Henry’s friends, but the high school drama was a little over the top for me. This sounds so unique. I know you said you didn’t enjoy it as much as expected, but I agree with Priscilla. The concept is so clever! When I first read it was a retelling, it sounded like a daunting task, to write something like that. But when reading it, the author was able to incorporate so many of the same dynamics from Henry’s court and modernize them. You’re leaning toward history lately, Teri. Too bad this modern retelling didn’t work as well as you’d hoped. It’s a cool premise. Didn’t even think about that, Staci. The books this week were read a couple of months apart, but just wound up on the same week. I don’t read much historical fiction, but occasionally one slips in. I don’t read a lot of historicals, either. But when I do, it seems to come in spurts. What an interesting premise! I’m also not a huge fan of high school social drama, but it does sound like the author did a great job with this. Thanks for sharing your review. I can take some – and as much YA as I read, I expect it – but this was a bit too much for me. It was still a very enjoyable read, Diana. Ah, that’s a pity, that synopsis sounded fun and interesting. I hate when a book i expect to enjoy doesn’t live up…. stilll, as a fan of high school drama (when done in a realistic manner), i may try this one up. For some readers, it’s not an issue at all, Jina – just a personal preference for me. The parallels to Henry’s life were really entertaining and creatively done. You should give it a try! An interesting idea, Teri, to write a modern day version of King Henry and his wives. We seem to be getting modern retakes on a lot of old stories recently. An intriguing review. I’ve noticed that also, Robbie – seems to be a trend right now. Your opening lines grasped me. Loving both Mean Girls and The Tudors you made me curious about this book. I watched Mean Girls many years ago, but it was The Tudors reference that grabbed me, Drew. I’ve always been fascinated by Henry and his life. Me too. Always fascinating to me. This sounds like an interesting read. I’m one of those who know basically nothing about The Tudors (gasp!) so it wouldn’t affect the modern take on the story. I might have to give this a try, thanks! I didn’t know much about them until The Tudors series, Jacquie, and knew some of that was embellished. But I did some research on my own and also read more factual books about that time period. Give it a try! Yeah… I’m not big on dramas or soap operas, and particularly not mean girls. But millions of people are. I would not have thought up this scenario — and I like that it’s imaginative. Thanks for this mindful review, Teri. Nicely done. Great big hug! Yep – I loved the Henry VIII references and the creative way the author modernized it, but the drama – not so much. Hugs, Teagan!